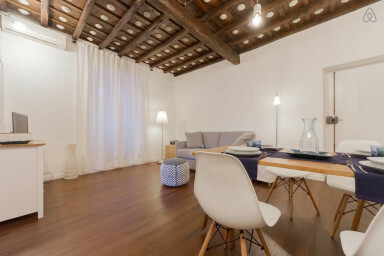 Bright, quiet and characteristic apartment in the heart of Trastevere. The apartment, just renovated, is equipped with every comfort and guarantees a relaxing and enjoyable stay. The modern and simple style of the furnishings balance the richness of the original ceilings, high and finely decorated. Located in the lively area of Trastevere, it is in a quiet street, on the first floor of a small building. Just one stairs level and you are at the flat door. You enter in the spacious and bright living room, where we find a wooden table and chairs for 4 people and a comfortable sofa that, if necessary, becomes a double bed. A large window on the right side and a charming artificial lighting give a serene atmosphere, perfect both for relaxing in front of the TV and for lunch with friends. To the left of the living room, the kitchen, complete with appliances for cooking and storing food and washing machine. From the living room, continuing, you get to the bedroom, where we also find a wardrobe, a wall closet and a small bookcase. Good rest is ensured by the quality of the mattress and the linen used, while air and light come from the two windows placed on two different walls. From the bedroom you enter the bathroom with shower, toilet, bidet and sink and aired by a high window. The apartment is located in a quiet street, even in the lively district of Trastevere. It is close to Piazza Trilussa, Via Garibaldi, the Gianicolo, the streets of Lungara and La Scala, not far from the Bambin Gesù and Santo Spirito hospitals, the John Abbott University and the famous Antica Pesa restaurant. An area full of local, known for the nightlife, but also full of history, art and culture. From the historical Renaissance center of Rome, via Giulia, cross Ponte Sisto, you pass Piazza Trilussa and, with a short walk, you reach the house. Great place close to many restaurants. We had 5 days at this Airbnb and we found the location central to everything. A lot of fantastic restaurants close by with a lively atmosphere. Once you cross over the river you have access to all the main Rome attractions. We were met late at night by Francessca who gave us the run down of the house and some great restaurant recommendations. The apartment has everything you need. I would definately recommend this apartment. I can recommend this great place and host. Perfect localisation, quiet, cosy, great equiped. The apartment is nice and looks new. Is comfortable. Has everything you need for a stay. Francesca and Mauro are very gently and take care about you need. The location is very good because you are in Trastevere by near ponte sisto, so you can walk to every spot in Rome.